On the eve of the Minsk-agreed ceasefire, locals in eastern Ukraine are far from being too optimistic. The horrors of the war leave little room for hope, RT journalists in the region have found out. Sixteen-hour-long talks in Minsk that took place on Thursday are to bring a much anticipated ceasefire to Eastern Ukraine commencing at 00:00 local time (22:00 GMT) on Sunday night. But residents of Donbas seem to have small faith in the peace deal, as sporadic shelling is nonetheless continuing – and the death toll, which already exceeds 5,300 lives, goes on counting off civilians. Saturday brought warm, spring weather to Donetsk – as well as the sounds of mortar firings and explosions, RT’s correspondent Murad Gazdiev reports from the city. “Why are they bombing us, why are they killing us, why are they destroying us? We will be buried alive. 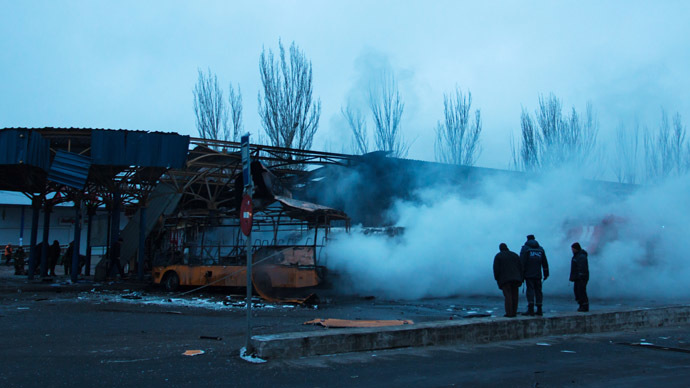 We will starve; we will rot in basements…,” a Donetsk resident told Gazdiev. “We hoped for that day the peace would come, the troops would be drawn off and this bloodshed and civil war would come to an end. But it didn’t happen,” a doctor of a local hospital also told RT Friday. “We already don’t know whether to believe if there could be any sense in the talks. We’d like to see peace. But the shelling goes on…,” said a couple of Donetsk pensioners, living in a basement for several months, as cited by Ria-Novosti. Three civilians were killed Saturday during shelling near the residence of Donetsk People’s Republic (DPR) head Aleksandr Zakharchenko. The explosion rattled the streets in central Donetsk near a group of journalists who were waiting for a press conference with the rebel leader. Meanwhile, a Kiev military spokesperson announced Saturday that seven Ukrainian servicemen had been killed and 23 wounded in the last 24 hours. President Petro Poroshenko puts the blame for the continuing shelling of civilians on the self-defense forces, seeing them as a threat to the Minsk agreement. “I don't want anyone to have any illusions and so I am not seen as a naive person: we are still a very long way from peace,” the president said on Friday. In the course of the previous day’s fighting on the ground, lives of nearly 100 military from each side to the conflict had been claimed, according to Interfax that cited the intelligence sources of the Kiev military and the self-defense forces. “The moment the coup d’état happened was the moment when Ukraine entered this tragic path of decline and degradation,” Anna Van Densky, political commentator at EU Reporter magazine, told RT. “People of the whole Ukraine and Donbas are hostages of this horrendous situation,” she added. Watch how a Russian journalist comes under fire during a live broadcast from Donetsk on Saturday. This statement, made just one day before the start of the ceasefire, could be a “provocation” that would be able to “destroy it”, giving “an excuse to go on for the other side,” journalist Lode Vanoost, former Deputy Speaker of the Belgian Parliament and former member of the UN mission in Kosovo, told RT. In their turn, the Donetsk self-defense forces reassured that they “will be acting according to what we have signed in Minsk,” and only “should there be no implementation [of the Minsk agreements], will we make relevant conclusions, and then the strategy will be immediately changed,” as cited by RIA-Novosti on Saturday. “I really want peace, for everything to improve. I wish no one to go through what I have – to be left old and alone with a crippled leg in a destroyed building,” an injured woman told RT on Thursday, when the peace talks were only underway, nourishing hopes and fears for the days to come.